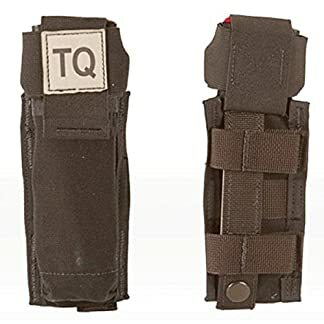 SWAT-T Tourniquet- REAL- A must have for any first aid kit, can be used as a tourniquet, a pressure dressing, or an elastic bandage. The SWAT-T is a great tourniquet. Fast and easy to deploy and very versatile. This Tourniquet is new and growing in popularity. Out of all the other tourniquets on the market this one will cause the least amount of damage to whom it is applied. 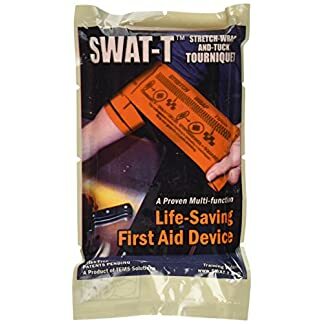 SWAT-T was the best tourniquet option especially if you have to apply this to a smaller child or and elderly person. 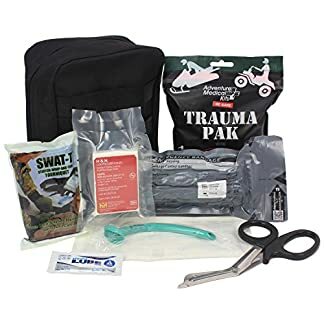 A FULLY STOCKED TRAUMA KIT – Ever Ready First Aid has combined both our tool kit and bandage kit in our durable first responders bag to create an ideal general purpose first aid kit for any situation. 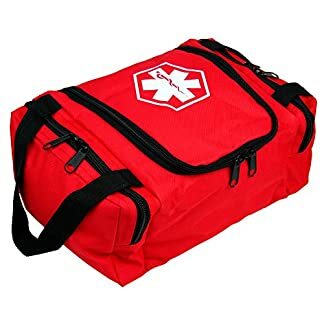 FIRST RESPONDER II BAG – An ideally sized 11″ x 8.5″ x 6″ bag that’s large enough to hold a wide variety of equipment while still being small enough to store and carry. One large main zippered compartment complete with foam divider, with two side zippered compartments on either side, makes organizing your tools and equipment easy and efficient. TOOL KIT – A collection of essential gear that no first aid kit should be without. Be prepared to treat a wide variety of injuries and emergencies with this collection of high quality equipment. 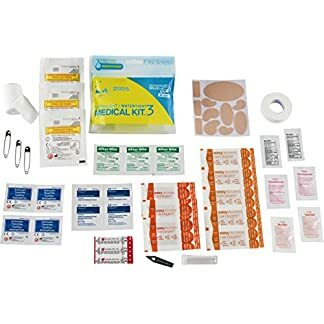 A KIT PACKED WITH ESSENTIALS – A small and lightweight kit that’s packed with high-quality equipment to treat a variety of emergencies and injuries. 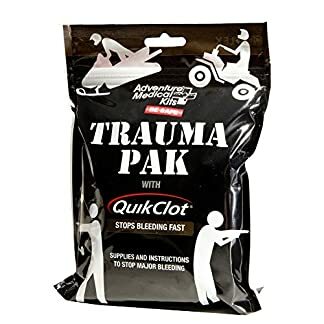 TRAUMA PACK WITH QUICKCLOT – Stop bleeding on site quickly and efficiently with this selection of essentials, featuring Quickclot advanced clotting sponge to stop bleeding fast. SWAT-T TOURNIQUET – Our kit now includes one of our highest quality tourniquets, the SWAT-T. Treat severe bleeding effectively and reliably. Made in Israel, vacuum sealed and up to date. Israeli Bandages are the most efficient hemorrhage regulate compression resolution, way to the revolutionary patented force applicator. 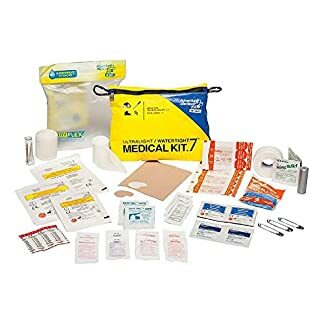 Must have item in any first kit, indoors, outdoors, home, work, ambulances, IFAK, earthquake kits, survival kits and the like. For immediate hemorrhage control in medical emergencies and trauma. Designed to treat every possible bleeding wound! Includes a built-in patented pressure applicator, non-stick pad, elasticated bandage, and closure bar. Quick & easy application – can be self-applied – a Proven lifesaver. Brand new, sterile & double Vacuum Sealed. Includes a built-in patented pressure applicator, non-stick pad, elasticated bandage and closure bar. Quick & easy application – can be self-applied – a Proven life saver. 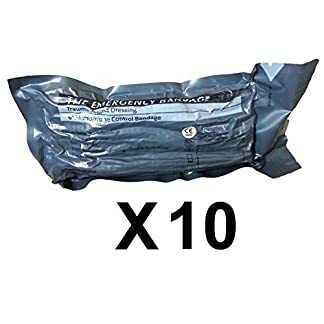 Brand new, sterile & double Vacuum Sealed.Genuine bandage made by First Care Products, product of Israel. The bandage is a standard issue for US and IDF soldiers as well as many other militaries and emergency response teams around the world. [LIFE-SAVING EQUIPMENT] – Hemorrhaging is the leading cause of preventable death in tactical and non-tactical trauma situations. Research has shown the Fast Application of a Tourniquet to be 100% effective in quickly stopping arterial blood flow in the shortest application time saving life and limb. 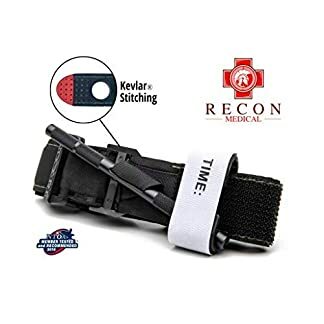 PATENTED Finger Hole design – ASSISTED OCCLUSION STRAP (AOS) Strap designed with finger hole for grip. Kevlar Stitching 4 inches from tip preventing Velcro delamination under extreme tension. Finger hole assists achieving positive tension while implementing device in wet, muddy, and bloody environments. Kevlar stitching perpendicular to strap end improves maintaining tourniquet tension during maximum pressure and largest strap diameter. Offers basic wound and blister management supplies. 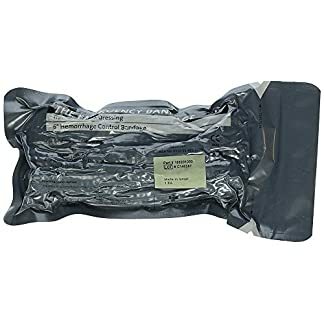 Nylon carry sack with zippered access measures 5.5 x 4 x 1.5 in.. Aloksak waterproof inner bag keeps contents dry under extreme conditions. Eight assorted sterile dressings, seven assorted bandages, tape, four Motrin tablets, two diphenhydramine tablets, and two After Bite® applications. Three antiseptic wipes, two antibiotic ointments, tincture of benzoin. Two butterfly closure strips, three safety pins, and splinter picker. Stop Bleeding Fast! 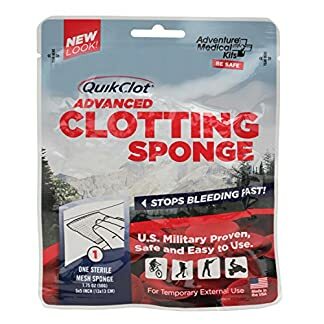 : QuikClot® stops bleeding 3 times faster than blood on its own. Keep Wounds Clean: Mesh bag keeps QuikClot® granules out of wounds. Beat the Heat! 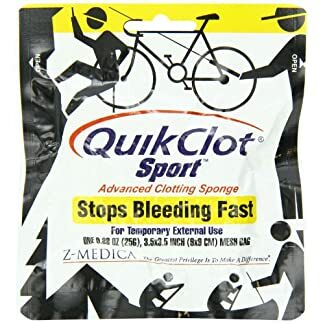 : QuikClot® Sport has been pre-treated to prevent burns. Stop Bleeding Fast! 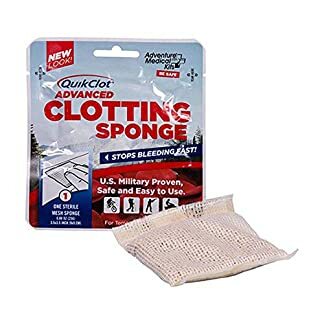 : The Advanced Clotting Sponge with zeolite stops bleeding fast. Clean and Close Wounds: Antiseptic wipes and butterfly bandages for closing small wounds. Dress Bullet and Arrow Wounds: Petrolatum gauze promotes healing and doesn’t adhere to deep puncture wounds. Mesh bag keeps quikclot granules out of wounds. 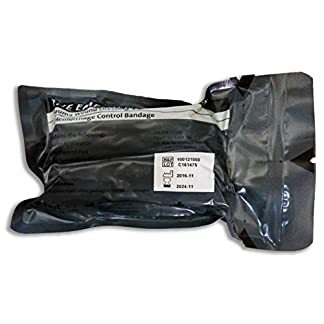 Contains an Advanced Clotting Sponge, trauma pad, triangular bandage, sterile gauzes, and other key supplies. 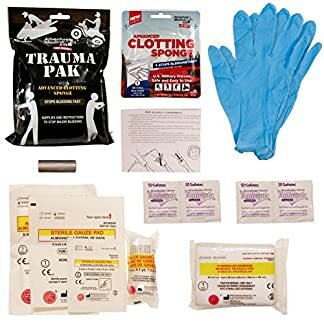 Includes one-page guide with life-saving trauma care instructions, including how to apply a tourniquet, stabilize fractures, manage gunshot wounds, and treat sucking chest wounds. 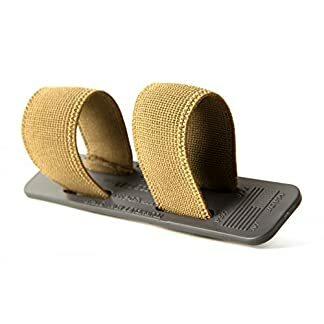 The elastic loops can fit numerous NATO style tourniquets such as the SOF-T, C-A-T, and other an identical sized tourniquets. 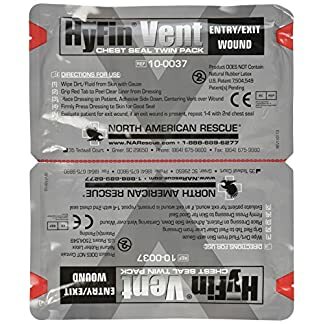 Rescue Essentials is pleased to introduce the new Hyfin vent chest seal twin pack from North American Rescue, this product sets the standard for the treatment of penetrating injuries to the chest. 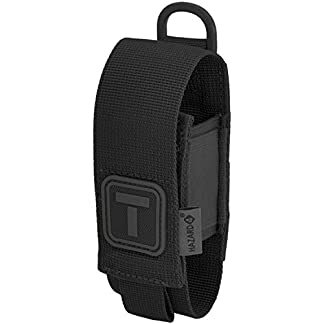 Adjusts to Fit C-A-T and SOF tourniquets and other brands; Molle backed with snap-strap. Belt or gear fit; Clearly marked 3-d rubber patch. 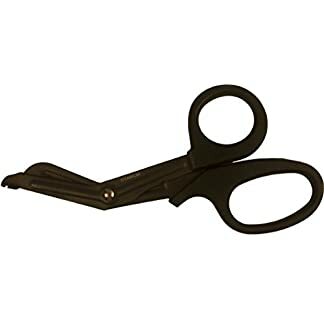 Pull tab aids in opening/closing; Side elastic storage. The pouch is EMPTY – you have to add the contents of the kit yourself. The SWAT-T Tourniquet is a latex-free multipurpose device. Tourniquet, pressure dressing, and elastic bandage. ORGANIZED. 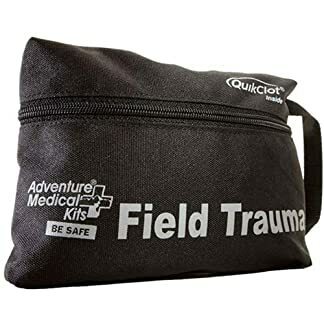 Spacious compartments which include several pockets, strong elastic loops and instrument holders, a Velcro safety strap, and zippered mesh compartment for small first aid supplies. 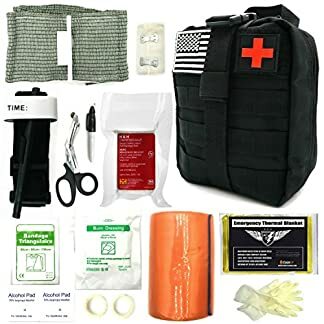 INCLUDES: A first aid patch and a small, mesh drawstring bag to store small first aid supplies. 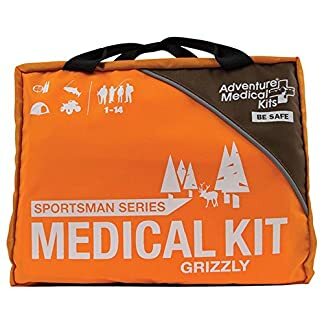 Adventure Medical Kits Sportsman Grizzly includes sterile bandage materials, wound care, blister/burn care, CPR face shield, fracture/sprain care, common medications, and essential tools, all contained in a high-visibility kit. 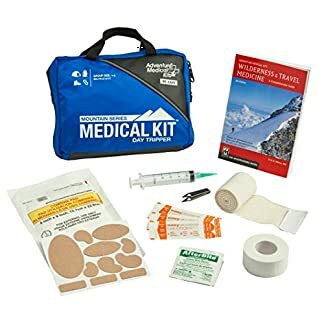 Provide hospital-quality care for groups of up to seven people on trips up to a week with this first aid kit suited for boat, basecamp, or backpack duty. 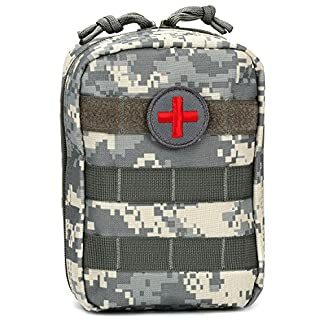 ✅【Everlit Emergency Trauma Kit】: Uniquely customized by U.S military VETERANS to get you well-prepared in advance to emergencies during the outdoor adventure, hunting, camping, travel, disaster, and accident. 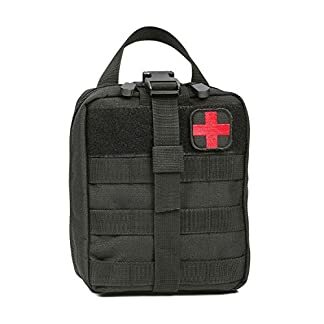 The Everlit Emergency Trauma Kit is ideal for field tactical medics, police, military, combat life savers, first responders, outdoor enthusiasts and more! 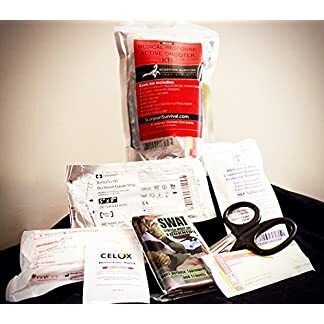 ✅【Massive Hemorrhage and Circulatory Care】: This kit contains the most use friendly, compact and popular survival and first aid supplies for massive bleeding control on the market, which includes: military combat tourniquet, tactical Israeli pressure dressing, and compressed gauze. ✅【Respiratory and Hypothermia Treatment】: Sealing the open chest wound seems like a no brainer for respiratory care. As a seal, a durable plastic packaging of any product in the kit can be used to seal the wound with the medical tape. A shock often occurs after massive loss of blood, which comes hand in hand with a drop of body temperature. The emergency thermal blanket is designed to keep body temperature warm as a treatment for hypothermia.